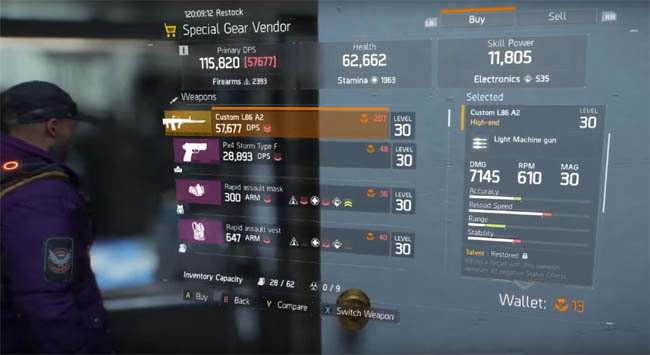 Outside of RNG loot, The Division offers two solid routes for getting High End weapons: either buying them or crafting from a range of resources in the game. The crafting option actually presents the best opportunity to build some of the game's most powerful weapons and also gives you the option to aim for Level 31 gear. Now the first thing you're probably wondering is where the hell do you buy blueprints? 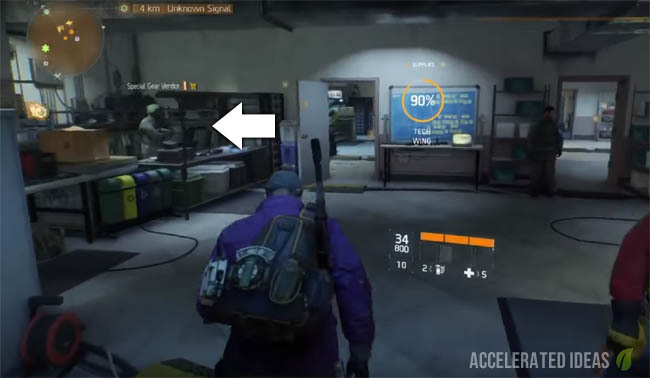 You've probably seen the wealth of blueprints that comes via Side Mission rewards but those only get you some Blue or maybe Purple weapons at best. There's nothing wrong with those and blue blueprints are actually a solid part of reaching level 30. However you want to get some of the yellow weapons in the game and so are interested in yellow blueprints right? Many players make the mistake of thinking that this vendor is part of an upgrade path for a particular Wing of the BoO. This is actually false and I understand the confusion because there is a vendor that you can unlock in the Security wing that offers some great weapons for sale - however they're not High End at all! The most important point to note is that this guy only appears AFTER you reach level 30, not before! So don't make the mistake of venturing around the base looking for him because he won't be there. It makes sense to be honest because even if you got your hands on the blueprints you wouldn't be able to use them because of the level 30 requirement. 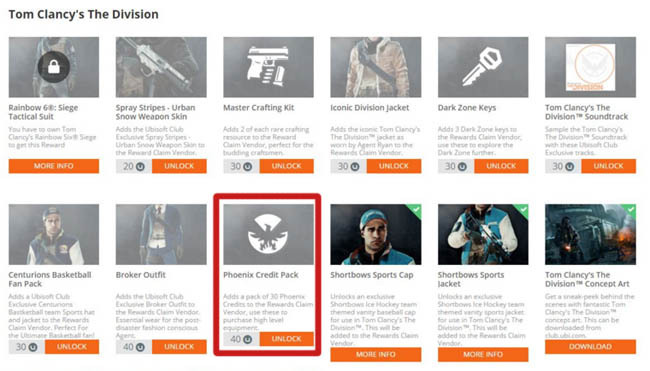 Interacting with the Special Gear Vendor presents a nice long list of weapon blueprints that you can purchase in exchange for the high end currency - Phoenix Credits. All the weapons you see are above the 100 credit mark thus meaning that a few Challenge missions or Dailies must be grinded out beforehand. Once you've got your mitts on a blueprint, take the prescription downstairs to the Crafting Station which is located to the left of the entrance of the BoO i.e. opposite the Security wing entrance. Hover over the blueprint to reveal the required crafting ingredients at the bottom of the screen. For all high end gear the crafting requirements will usually be yellow Weapon Parts and Tools. You don't start out with yellow resources and so must trade lesser resources for superior versions in a kind of progressive exchange system which eventually yields yellow gear if you've got enough of the lower tiers. This can all be done through the Crafting Station, just scroll down to the bottom of the list for the material exchange options. Crafting a weapon will assigns random Talents which can make a huge difference to the overall weapon. Sometimes it's good to craft several version of the same weapon (if you have enough resources) to iron out a "perfect" high end. Something rather strange exists for high end gear - they can actually exceed the Level 30 maximum present in the game. This is especially important for crafted gear which can allow you to create level 30+ weapons, making them ideal for new high level content coming in future updates. How can you check if gear is Level 31 and not Level 30? 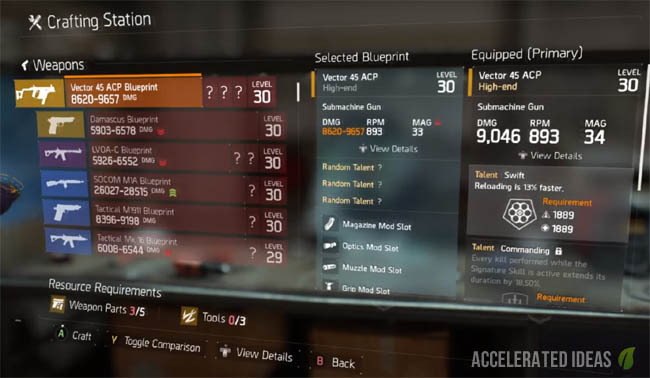 Well, there is currently a known bug in the game which means that to see if a blueprint will yield a level 31 weapon you need to scroll down the list of Talents and Perks for the weapon until you reach the Power Level section. If the Power Level says 31 but the requirement is 30 then you know this is going to be a keeper! 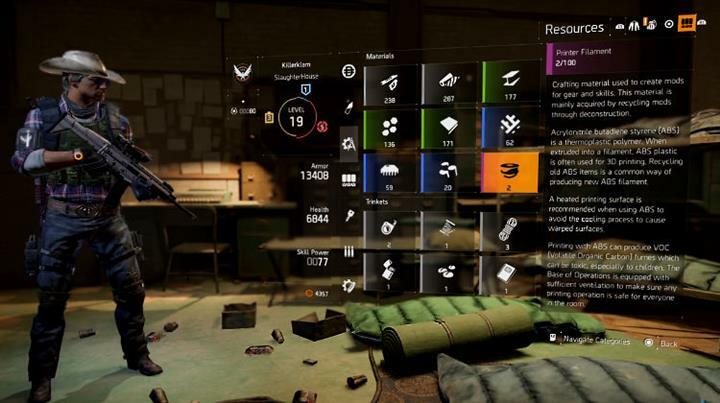 Check the screenshot above which shows a Police Mk17 with a Power Level of 31.